Is it just me or does it seem like a lot of people in the anime industry seem to be dying lately. Of course as anime gets older, so do the ones who were there from the inception, like the death earlier this week of a voice actor from Ge Ge no Kitaro, Isamu Tanonaka. But there seems to be a number of people who die young or under strange circumstances. The creator of Shin Chan, Yoshito Usui, died last year hiking and a number of young voice actors died from horrible diseases within the last couple of years. Of course with a medium as expansive as anime, and with all the people involved a few people are going to meet untimely ends. 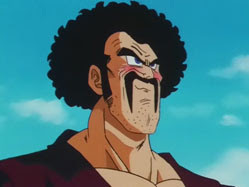 Well add another to the casualty list as Daisuke Gouri, the voice of Mr. Satan from Dragonball Z died this week. Gouri was found Edger Allen Poe-style, face down on the street. However, unlike Poe, whose death remains a mystery, Gouri seems to be a clear suicide, as his wrist was slashed and he had on him his will. A sad end to a great voice actor that provided probably the best comical moments in Dragonball Z. Some of Gouri's other roles include Dozle Zabi and Bask Om from Gundam, Hiromi Yamazaki in Patlabor, and Heihachi Mishima in the Tekken video game series.